We have sold around 4000 books in the last two years. These are sales of all Rinpoche’s books that we publish, which are currently: 6 Lazy Lama Series books; 7 Heart Wisdom Series books; 1 book of stories. Our largest investment of profits, made this year, has gone into creating a new online web archive which will give members access to all Rinpoche’s teachings in recorded format. This large scale project is very much still in progress but you will be the first to hear when it is ready…. We also made a donation to Rigul Trust of £1500 from profits made. 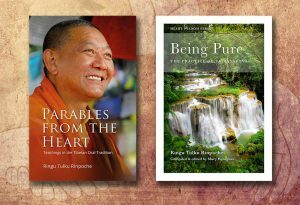 We published two new titles over the last 12 months: “Parables from the Heart,” a collection of Rinpoche’s stories, edited by Patricia Little, with Mary Heneghan. And “Being Pure: The Practice of Vajrasattva,” compiled and edited by Mary Heneghan. All our titles remain on sale from the Bodhicharya website Book Shop and Amazon. Thank you for supporting this work through buying Rinpoche’s books – we hope you enjoy them. by WANGDU on JULY 29, 2016 in NEWS, PUBLICATIONS.